An armed robbery of the pharmacy at the Walgreens store in Walnut Creek. Thom Jensen reports. 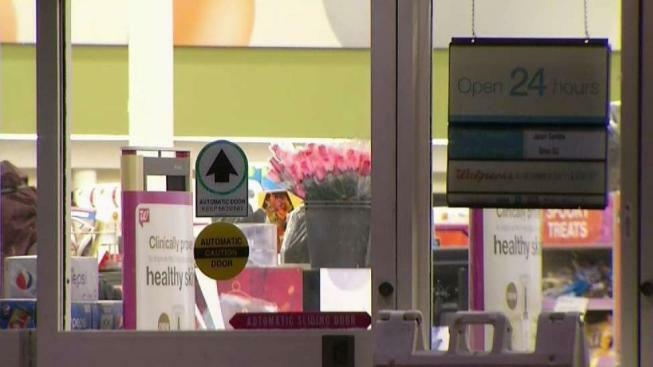 A man jumped a pharmacy counter at a Walgreens in Walnut Creek late Monday, grabbed opiate-based medications and took off on foot, according to police. The armed robbery took place around 10:45 p.m. at the Walgreens located at 2900 N. Main St., police said. After jumping the counter, the male suspect threatened employees with a gun and stole the medication before fleeing on foot toward Treat Boulevard, according to police. The suspect is described as an adult male in his 20s or 30s and approximately 5 feet 10 inches tall, according to police. He was believed to be wearing a dark sweathshirt and dark pants. No one was injured during the robbery, police said. Anyone with information about the robbery is asked to call the Walnut Creek Police Department at 925-943-5844.